Photo by Ron Lang, USDA-APHIS-PPQ, UT. Description: Dyer woad, Isatis tinctoria, is a winter annual, biennial, or a short lived perennial. This weed is also a member of the mustard family. An annual is when a plant grows only one year or season. Biennials are plants that live for two years. Perennials are plants that live for many years. Roots: The thick tap roots of dyers woad can be 3-6 meters in depth. Leaves: The leaves are simple blueish-green covered with fine hair. The vein on the upper part of the leaf blade is whitish cream. Stem: The stems range from 1-4 feet tall. The stem leaves are spear shaped and embraced by the stem. Flower: Flowers have a flat top with yellow petals. These can be found in terminal groups at the branch/stem end. The flower produces the fruit. Fruit and seed: The fruit is a single seed closed in a flattened green pod. Sooner or later it will turn a black or a darkpurplish brown color that is used to identify this weed after flowering. This noxious weed spreads by seed in late spring to mid-summer. 1% of the first year germinated seeds flower the first spring. After this 35% last through the next winter and half of these flower the following spring. 12% flower the third spring. An example of how fast dyer's woad spreads is an a infestation near Dillon, Mt. In two years it spreads from two acres to one hundred acres. Montana Infestation: In Montana dyer's woad is located in Silver Bow, Park, Beaverhead, Missoula, Sweetgrass, and Gallatin counties. This totals up to an increasing 323 acres. 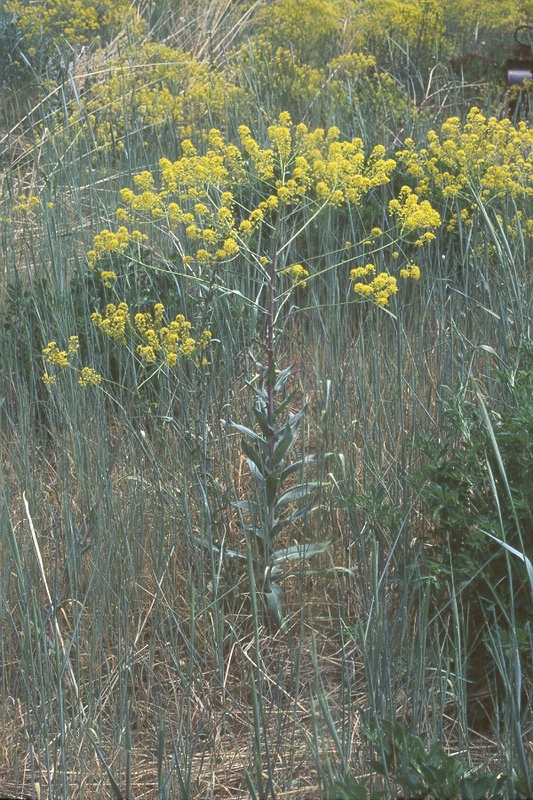 Environments Favorable to Infestation: Dyers woad will tend to grow in rocky soils with minimum water holding capacity, and threatens rangelands, pastures, and forests. This a major problem because dyers woad overtakes native grass, and most livestock and wildlife don't graze it. Impacts: Dyers woad is source of blue dye and was cultivated for this. Dyers woad hurts livestock and wildlife by reducing their natural grasses. Native Range/Entry to North America: Dyers woad is native to southeast Russia, Western Tibet, China, and Afghanistan. When this weed came to Europe farmers noticed it after traveling dye makers left the area. Dyers woad has been cultivated in England for blue dye since the early 13th century up to the 1930's. It was introduced to North America by the colonials. It is commonly found in southeastern Idaho, northern Utah, northern California and spreading into southern Oregon from California. Methods of Control/How to Prevent Spread: The chemical control, for large infected areas, is herbicides. The most effective seems to be metsulfuron combined with 2,4-D. Hand pulling, tilling and burning are cultural controls, usually for small infestations. However, burning only slows down the spread of dyers woad, but doesn't usually kill the roots. There are no available biological control insect agents at this time (1999). However, a close relative of the Eurasian rust fungus Puccinia thlaspeos is used as a biological control agent to slow the spread of dyers woad. The rust can enter the plant through inoculation on the leaf surface and systemically damages the plant to the roots. It can prevent or reduce seed production and may also affect the survival of seedlings, rosettes, and overwintering plants. Researchers are not sure of the identity of this species and are uncertain as to how it moves through the plant. The rust is able to complete its life cycle on I. tinctoria alone and does not seem to require a secondary host like many rusts do. 1) Breitenfeldt, Todd, Personal Interview, Biology Teacher, Whitehall School, P.O. Box 1109, Whitehall MT, 59759. (406)287-3862. 2) Callihan, Robert H. and Timothy W. Miller. Noxious Weeds Dyer's Woad, [online] available: Http://www.oneplan.state.id.us/pest/nw07.htm. September 15,1999. 3) Henery, Charlie. Secretary, Colorado Weed Management Association, Thirty Noxious Weeds, [online] available: http://www.fortnet.org/CWMA/dyerwoad.htm. September 15, 1999. 4) Henon Gretchen and Roger Sheley, newspaper, Dyer's woad can overtake native plant communities. Southwestern Montana's War on Weeds, 1998, p. 12. 5) Lacey, C., R. Petroff, and D. Zamora, pamphlet, New Weed Invaders of Montana, Montana Noxious Weed Trust Fund Montana Weed Control Association. 6) William, Morris, New College Edition, The American Heritage Dictionary of the English Language, published by Houghton Mifflin Company, 1976. 7) Zimmerman, Julie A.C. Ecology and Distribution of Isatis tinctoria (Savi) Ten. Brassicaceae, USGS Southwest Exotic Plant Mapping Program, [Online] Available: http://www.usgs.nau.edu/swemp/Info_pages/plants/Isatis/itinctoria.html - top8-5-97. 8) Flaherty, Carol. Earn $50 and Keep This Pest Away. The Billings Outpost, http://www.billingsnews.com/story?storyid=11412&issue=214 Thursday, June 24, 2004. 9) Enz, Tamara and Monica Pokorny. Stop the Spread of Dyers Woad. Montana State University. http://www.montana.edu/wwwpb/pubs/4491hr.pdf. 10) Dyers Woad. State Noxious Weed Control Board, http://www.nwcb.wa.gov/weed_info/Written_findings/Isatis_tinctoria.html 03/12/05. By: Amber O' Donnell, Published By: Homer R. McKinney (1990's). Updated by: Ben Wideman 2/21/06.